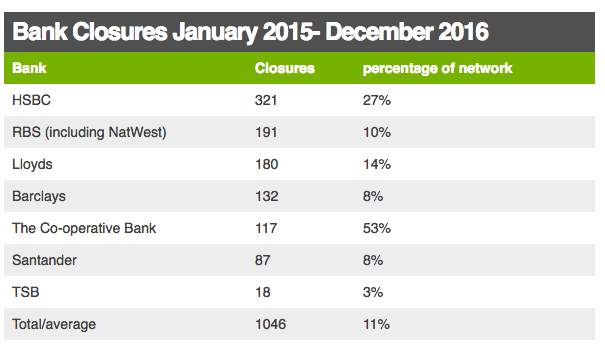 Bank closings are continuing at a frenzied pace in the United Kingdom. Since January 2015, more than 1,000 branches have been shuttered, with HSBC closing 27% of its branches and Lloyds Bank closing 14%, according to a new analysis by the Which?, a major U.K. consumer research firm. Adding to the damage, Lloyds has already announced that it may have as many as 200 additional location closures for 2017. Among large banks, these two financial sector giants were followed by RBS (10%), Barclays (8%), and Santander (8%). A smaller institution, The Co-operative Bank, has shut down a staggering 53% of its physical locations over the past two years as it — like the rest of the world — adjusts to a world in which more and more transactions are done digitally. While bank closings are somewhat just a sign of the times — and highlights the opportunities present in the market for digital-native fintech startups — a recent Business Insider report highlights why banks need to tread carefully as they chase higher efficiency. Shutting more and more branches will reap some major overhead savings. But it also may further splinter the already-fragile loyalty that many clients now have with their banks, says the organization. Thus, the speed to digital transformation for large legacy banks is becoming increasingly important as they start to lose the physical branding and operating model advantages they have historically had over their online competition. Tagged with : Barclays , England , HSBC , Lloyds , London , RBS , Santander , The Co-operative Bank , united kingdom , Which?